﻿ Hebrews 11:19 He considered that God is able to raise people even from the dead, from which he also received him back as a type. He considered God to be able even to raise someone from the dead, from which he also got him back as an illustration. Abraham was certain that God could raise the dead, and figuratively speaking, he did get Isaac back in this way. Having reckoned that God is able to raise up even from the dead, from where also, in a figure, he did receive him back. accounting that God is able to raise up, even from the dead; from whence he did also in a figure receive him back. For he reasoned that God was able to raise [him] up even from among the dead. Indeed in the sense that Isaac was figuratively dead [potentially sacrificed], he did [actually] receive him back from the dead. [So], he reasoned that God was able to raise up [Isaac] from the dead, which, in a sense, he did receive him back [from the dead]. for he concluded that God was able to raise him up, even from the dead; wherefore he received him even in like manner. Judging that God was able to give life even to the dead; and because of this he did get him back as if from death. He considered that God was able to raise men even from the dead; from which, figuratively speaking, he did receive him back. concluding that God was able to raise him up, even from the grave; from whence, in a figurative sense, be may be said to have been recover'd. counting that God was able to raise him even from among the dead, whence also he received him in a figure. considering that God is able to raise him from the dead; whence he also received him in a figure. For he believed that God was able to raise men even from the dead, and from the dead he did indeed, to speak figuratively, receive him back. Accounting that God was able even to raise him from the dead; from whence also he received him in a figure. accounting that God was able to raise him up, even from the dead; from whence he also received him in a figure. Reckoning that God was also able to raise from the dead; whence he also received him in a parable. Accounting that God was able to raise him up, even from the dead; from which also he received him in a figure. having reasoned that God [was] able even to raise [him] from the dead, from which he received him back also as a symbol. concluding that God was able to raise him up, even from the dead, from where he even received him, in a figure. For he considered that God was able to raise up again from death. Wherefore received he him, for an example of the resurrection. 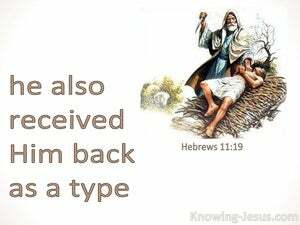 For he accounted God able even to raise from the dead, from whence, figuratively speaking, he did indeed receive him back again. and he reasoned that God could even raise him from the dead, and in a sense he received him back from there. concluding that God is able to raise up even from the dead. Figuratively speaking, he also did receive him back from the dead. accounting that God is able even to raise from the dead; whence also he did figuratively receive him back. judging that God was able to raise even from the dead; whence also in a figure he received him. Accounting that, even from among the dead, God, was able, to raise him , - whence, even in similitude, he bare him away. reasoning that God was able to raise him up again, even from the dead; from whence also figuratively he had received him. For he argued that God was able even to raise a man from the dead--and indeed, figuratively speaking, Abraham did receive Isaac back from the dead. Accounting that God was able to raise him even from the dead; from whence also he received him in a figure. For he reckoned that God is even able to raise a man up from among the dead, and, figuratively speaking, it was from among the dead that he received Isaac again. For he considered the fact that God was able to raise people from the dead; and so from the dead, in a figure, he did receive him back. accounting that God is able to raise even from the dead; whence he did also, as in a figure, receive him back. concluding that God was able to raise him even from the dead; from whence indeed he had in a manner received him. reckoning that even out of the dead God is able to raise up, whence also in a figure he did receive him. 18 it was he to whom it was said, "IN ISAAC YOUR DESCENDANTS SHALL BE CALLED." 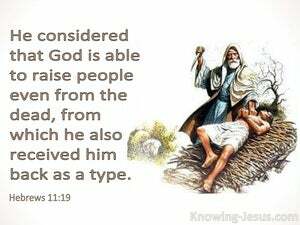 19 He considered that God is able to raise people even from the dead, from which he also received him back as a type. 20 By faith Isaac blessed Jacob and Esau, even regarding things to come.